...that Kig-Yar pirates established a massive outpost on Ven III? ...that the UNSC Spirit of Fire received its thrusters in 2530 from the UNSC Calcutta? The Sniper Rifle System 99C-S2 Anti-Matériel, abbreviated SRS99C-S2 AM, is a standard-issue sniper rifle of the United Nations Space Command. It is part of Misriah Armory's SRS99 Series. The SRS99C-S2 AM is a semi-automatic, gas-operated sniper rifle that fires 14.5×114mm APFSDS rounds from a 4-round magazine. It is, alongside its primary Covenant counterpart, the Type-50 particle beam rifle, the most accurate and arguably the most powerful small-arms weapon in either arsenal. The rifle features a barrel about 187.5cm long and is completely interchangeable. The Sniper Rifle System 99C-S2 Anti-Matériel B, abbreviated as SRS99C-S2 AMB Sniper Rifle, is a configuration of the SRS99C-S2 AM Sniper Rifle. The AMB variant includes a different scope and a better designed grip for stability and accuracy. It is slightly shorter than the base model (of 187.5 centimeters), measuring to 168.5 centimeters. The SRS99 series/Gameplay is designed to be used at medium to long ranges and is equipped with an electronic scope for precisely this purpose. It is tremendously useful in its designated role, considering its extraordinary range, which surpasses any other weapon of comparable size, and its incredible stopping power even against body armor and Covenant shielding system. By far, one of its most useful applications is taking out higher-ranking targets from long range to destabilize their squad's discipline and morale. A headshot will kill any Covenant infantry except a high-ranking Elite or Brute. Hunters fall from two shots to their unarmored torso or neck. This does not account for The Flood, however, due to their morphology. The Flood can, however, be rendered harmless by removing their limbs or by placing a round into the embedded infection form. In multiplayer, the SRS99 series can be highly effective at close range in the hands of a skilled operator, as the highly damaging round is just as powerful at close range; a single round followed by a melee strike will kill a hostile almost instantly. The rifle's projectile has a slight travel time at great distances, and requires practice to use effectively at range. When used in close quarters, its precision nature, slow reload time, small magazine capacity, heavy recoil, and slow rate-of-fire leave precious little room for error. A small combat load and the relative scarcity of ammunition available for the weapon also make it bad practice to expend ammunition on smaller, less threatening combatants, such as Grunts. The SRS99 series/Gameplay is also largely ineffective against most Flood forms, due to their body organization; damage done by the SRS99 series/Gameplay is minimal to the Flood forms due to their biological constitution and would only cause the Flood form to flinch for a moment. It is often recommended for operators to simply switch to other weapons should they encounter a Flood form. As in all previous games, rounds fired by the SRS99 series/Gameplay leave a trail that could be traced back to the sniper's location. When using the scope, the glare from the reflection will be visible to the enemy and may alert them to your presence. The rifle is ineffective against even light-skinned and unarmored vehicles unless a shot can be taken on the vehicle's occupants, except for Wraiths. Maximum telescopic zoom reduced from 10× to 8×. Minor cosmetic changes and shorter overall length. Rifle identified as "AMB" variant. Decreased the maximum reserve ammunition capacity down from 28 to 24. Medium telescopic zoom increased from 2× to 5×. Night vision function has been removed. Now capable of damaging and destroying vehicles. During an interview, William O'Brien, an animator for Halo 2, said, "Robert McLees is definitely the go-to guy for the gun stuff. I wanted to come up with an animation for the sniper scope, an 'idle cycle'. If you activate the scope, and then sit too long without doing anything, the animation would kick in periodically, just to keep things interesting... Simple, right...? He replied, 'No way. If you adjust your scope in the field, you're dead. Snipers don't do that.' That's how detailed his weapon designs are -- not just guns, but how they work, and how a sniper would fire them. Amazing." In the original Xbox 360 version of Halo: Combat Evolved Anniversary the sniper rifle's reticule is far larger than it is in the original Halo: Combat Evolved on Xbox and PC. In the Halo: The Master Chief Collection version of Halo: Anniversary, the reticule returns once again to its original size. An in-game profile view of an SSR99C-S2AM Sniper Rifle in Halo: Combat Evolved. Front and back views of the sniper rifle as seen in Halo: Combat Evolved. A first person view of the SRS99C-S2AM in Halo: Combat Evolved. First-person view of the SRS99C on Blood Gulch. The 2× scope of the SRS99C-S2AM in Halo PC. The 8× scope of the SRS99C-S2AM in Halo PC. The night-vision function of the scope of the SRS99C-S2AM in Halo PC. The SRS99C-S2 AM's targeting reticule in Halo PC. Front and back views of the sniper rifle as seen in Halo 2. An in-game profile view of the SRS99C-S2AMB Sniper Rifle in Halo 2. A first person view of the SRS99C-S2AMB in Halo 2. The Master Chief with an SRS99C-S2 AMB in Halo 2. The SRS99C-S2 AMB's targeting reticule. 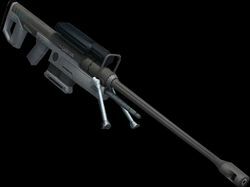 Views of the sniper rifle as seen in Halo Legends: Homecoming. A Marine using an SRS99-S2 AMB with a spotter beside him. The SRS99C-S2 AMB in Halo 2: Anniversary campaign. The 5× zoom in campaign. The 10× zoom in campaign. An SRS99C-S2 AMB being used in Halo 2: Anniversary multiplayer. An SRS99C-S2 AMB being used by a Spartan on Lockdown. An SRS99C-S2 AMB being used by a Spartan on Shrine. A Spartan using the SRS99C-S2 AMB on Stonetown. First person view of the SRS99C-S2 AMB. The 5× zoom in multiplayer. The 10× zoom in multiplayer.